My work focuses on two essential questions: “How do people learn with technology?” and “How can we improve learning environments using technology?” I believe strongly that in order to deduce guidelines for effective teaching, we must have a solid understanding of the motivations, contexts, and mechanisms underlying learning. I am very interested in informal learning because informal, and often incidental, learning experiences precede formal education, and I think there is much to be learned about improving formal education in K-12 schools and colleges by examining how people learn individually and in groups outside the formal classroom environment. 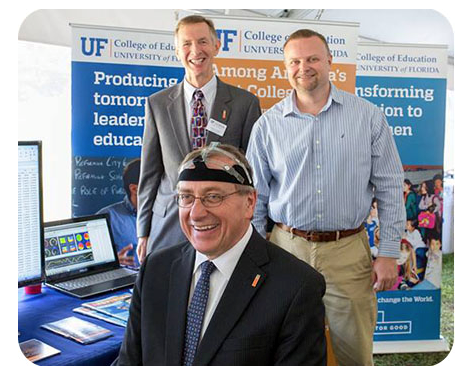 UF President Kent Fuchs is trying on one of the EEG headsets used in Dr. Antonenko’s NeurAL Lab, http://www.antonenko.org/lab. When I study learning, I focus on both the outcomes (or products) of learning and the processes underlying learning within diverse groups of learners. Traditionally, educational researchers have focused primarily on learning outcomes. However, the problem with that is if we only focus on outcomes we have little understanding of why certain learners succeed in certain contexts and using certain tools, while others do not. What makes my work interesting and useful, I think, is I cross traditional disciplinary boundaries and try to use the research methods and tools used by cognitive psychologists, neuroscientists, and computer and information scientists to study the mechanisms underlying learning. One example is my contribution regarding the use of Electroencephalography, or EEG, in educational research. I use EEG to study the dynamics of cognitive processing during learning. Tools like EEG allow us to record and study the rhythms of our brain waves and based on the analysis of brain wave synchronization we can infer the levels of working memory load, or the intensity of cognitive processing, at any point of time during the learning process. 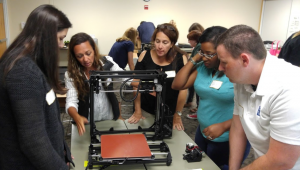 Dr. Antonenko’s PhD student Claudia Grant and PK Yonge teachers Taylor Whitley, Mayra Cordero, Tredina Sheppard, and Rudy Simpson assemble a 3D printer for the iDigFossils project. 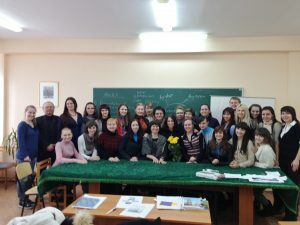 Maria Coady (center) with teachers and teacher-educators in Kryvyi Rih, Ukraine. I enjoy finding innovative solutions to complex educational problems related to second (English) language and literacy development. My work broadly investigates how teachers and students navigate the linguistic spaces in which they participate. So I investigate how to prepare teachers to work with English learners (ELs) in those spaces in ways that affirm and build upon their linguistic and cultural knowledge. My research in the US looks primarily at Spanish speakers, who comprise about 80% of our English-learning student population, and I look at the biliteracy development of those students as demonstrated in their writing. I also want to ensure that that parents and caregivers are part of the overall educational experience of their children. We understand the importance of parental participation in student success, so I look to identify culturally- and linguistically-responsive ways to facilitate parental participation. 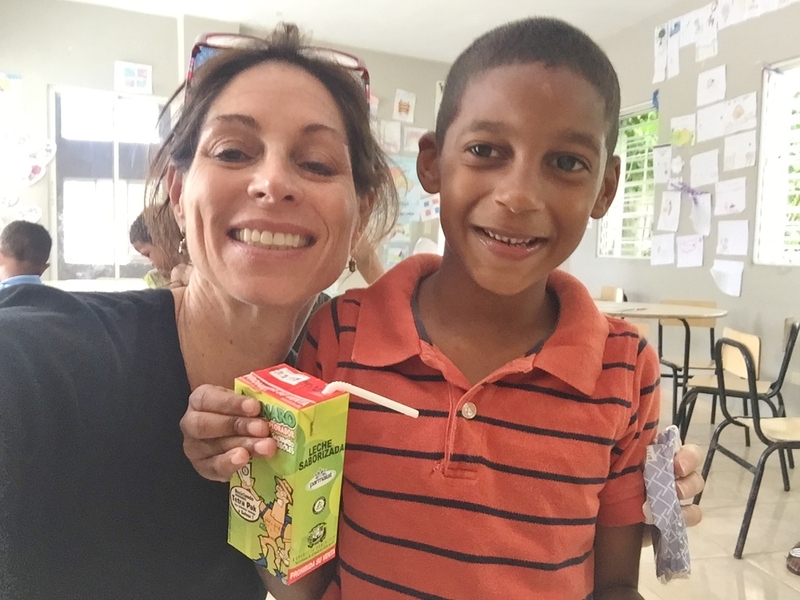 Maria Coady with a young student in Santiago, Dominican Republic during merienda (snack time), in our emergent literacy in Spanish classroom. The people! I am fortunate to work with incredible teachers, families, and community organizations who really make a difference in the lives of people. Over the past few years, I have focused on a significant amount of teacher professional development in the international arena. I have met teachers and educators from around the world who are dedicated to making a difference in the lives of their bi- and multilingual students. This international work has reminded me of the diverse landscape of World Englishes, and the rich linguistic resources of children and families around the world. 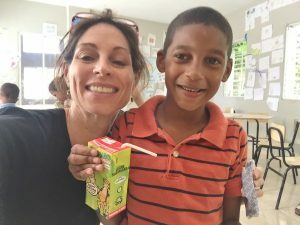 Over the past three years, I have worked with teachers and educators in Ukraine, China, the United Arab Emirates, Costa Rica, the Dominican Republic (in Spanish for emergent Spanish literacy), and South Africa. Some of this work is funded by the Fulbright Commission under the US State Department. This coming summer, I hope to take a group of UF students on a study abroad to the Republic of Ireland to observe bilingual schools there called Gaelscoileanna. 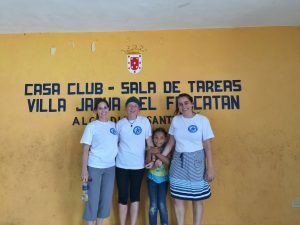 Maria Coady with Amber Peretz (UF COE ProTeach student) and Ava Long (UF) with a student in Santiago, Dominican Republic. Locally, I have been working with rural school districts in Florida and am particularly interested in the challenges that teachers, students, and families face in rural contexts where resources are limited. I will be looking closely at teacher education in rural contexts and building family-school partnerships for English learning families and students. Rural settings are often overlooked in the national conversation on “high-quality teacher education.” I am in the process of writing a book on this topic and hope to have it published within the next two years. The State University System of Florida has created a helpful guide to assist faculty in applying for federal agency advisory boards or committees. As explained in the guide, service on such committees and advisory boards is an excellent way to contribute to both the university at large and the agency served. Further, such service can enhance one’s own professional development and career trajectory via gains in knowledge about the grant making process as well as through networking and leadership opportunities. The guide below provides information about agencies with such positions and how to be selected for them. We would like to pass along some information to help our State University System faculty and administrators when considering an application for service on federal agency advisory boards or committees. In this increasingly competitive federal funding environment, such service may help your institution and the individual become even more successful in the grant application process. There are over 1,000 agency committees across the government. Service on them usually involves a 4 or 5 year term appointment. Travel and related expenses are covered by the sponsoring agency. Serving on these committees can provide faculty with valuable knowledge and insight about an agency’s culture, budget and inner workings, as well as exposure to agency leaders and decision makers. The government maintains a centralized access point for all “Federal Advisory Committee Act” committees arranged by agency. See: http://www.facadatabase.gov/. This database provides important information about the committees, including their decision-makers and general information. It contains a wealth of information for each committee. Click on each agency of interest to see the latest list and links to each. For instance, to find NIH-related committees, click on the Department of Health and Human Services and then click on the committee of interest to see background information and the contact information for the relevant official. The link will take you to a complete list of government agencies sponsoring committees under the Federal Advisory Committee Act, a law that specifies certain procedures for open meetings, adequate meeting notice and chartering. From there you can select an agency of interest. For example, clicking on the Department of Health and Human Services link will provide a list of 267 committees operating under the agency. Selecting a particular committee will provide general information, members and the contact or decision maker relating to the committee. Committees range from the Advisory Board on Child Abuse and Neglect to the World Trade Center Health Program Scientific Technical Advisory Committee –and everything in between! Once a committee has been identified, normally a letter of nomination is required to the appointing official, often the Department Secretary. These letters can be sent by other faculty, deans, school presidents, association leaders. Usually a local Member of Congress can also provide a letter of endorsement if the faculty member is known to the Member. Often for peer review groups, the process involves a self nomination. It also generally helps to have your professional association, university supervisors or some other third party who is familiar with your work write a letter of support. 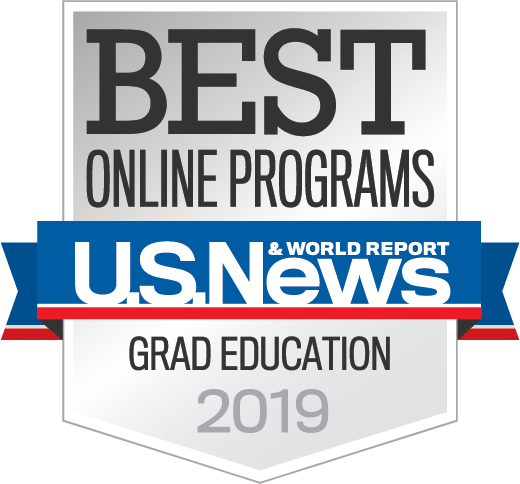 In addition to the main committee link provided above, your faculty may also want to explore the websites of individual agencies for more information on other committees, especially peer-review or study sections that review grants. For example the National Institutes of Health, National Science Foundation and Department of Energy each have great need for faculty, including early career reviewers, to serve on peer review committees to judge grant applications. Reviewers with a substantial commitment to NIH review also can submit at anytime applications that would otherwise have a standard due date. Prepared by Cavarocchi-Ruscio-Dennis Associates for the State University System of Florida. For more information, contact Brent Jaquet at bjaquet@dc-crd.com or 202 484-1100. The UF Office of Research is considering offering a third 2.5 day National Council of University Research Administrators (NCURA) Departmental Research Administration workshop this fall. The workshop was offered in February and May to full sessions and very high marks. If there is sufficient interest, we will offer this same workshop for the third time this year — from November 30-December 2. The cost of the workshop would be $600 per attendee. If you are interested, please register your interest at: http://research.ufl.edu/or/research-events/ncura-fall-workshop-survey.html. This would not be an absolute commitment to attend, simply a way to gauge if UF could support filling the 60 slots required at minimum for NCURA to allow us to host such an event. If you have not yet done so, consider creating an ORCID identifier and profile to track your research publications and grant submissions. As described on the ORCID website, ORCID “provides a persistent digital identifier that distinguishes you from every other researcher and, through integration in key research workflows such as manuscript and grant submission, supports automated linkages between you and your professional activities ensuring that your work is recognized” (http://orcid.org/). ORCID has made some important changes to their functionality and user interface to better optimize their system. See below for important updates on changes to the ORCID system from the ORCID Team (support@orcid.org). You may be aware of a website called Sci-Hub, which is a potentially illegal repository of millions of academic journal articles stored online. Articles posted on this website routinely violate the original copyright agreements set forth by the articles’ authors and journal publishers. University of Florida-affiliated individuals are discouraged from accessing or participating in any Sci-Hub activities, including using this website to access research articles. The University of Florida subscribes to numerous academic journals, free access to which is provided for all University of Florida faculty, staff, and students (http://cms.uflib.ufl.edu/). Over eleven million pages from the libraries’ collections have been digitized for online public access. Each year 1.2 million pages of archival, photo and textual materials are added. There are over 85,000,000 unique material views annually to the digital collections’ web site. 43,648 UF theses and dissertations are available through the libraries. Over 20,000 are available online. To this end, PIs are required to know the regulations regarding data management plans for each grant submitted as specific requirements may vary by granting agency. The University of Florida’s policies on public access to data and data management plans are available here: http://cms.uflib.ufl.edu/ScholComm/publicaccessFAQ. Data management plans are an essential component of ensuring that federally-funded research will be made publicly available. As of early 2016, almost all federal funding agencies have begun requiring data management plans to be submitted in conjunction with large grant proposals (Grant Writers’ Seminars and Workshops, LLC). Data management plans outline how and for how long research data will be preserved as well as how it will be used. Notably, a dedicated Data Management Librarian is available to address any questions PIs may have regarding the data management plan process. 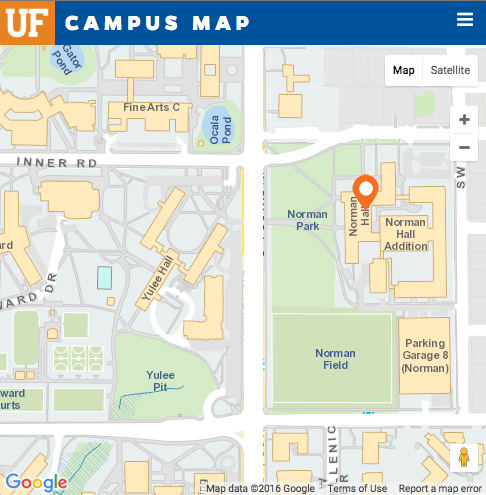 The George A. Smathers Library System has created a specific and highly recommended guide explaining how to develop a data management plan for grants based out of the University of Florida (http://guides.uflib.ufl.edu/datamanagement). Additionally, the University’s Division of Sponsored Programs has grant analysts and compliance officers who can help with the details of compliance. Further, the Scholarly Communications Librarian or the library liaison assigned to your department can advise you on the many practical applications of compliance with a federal public access policy and can advise on such issues as choosing an appropriate repository where one is not specified. Additional resources on how to construct a data management plan are also available through North Carolina State University (https://www.lib.ncsu.edu/guides/datamanagement/funding_agencies) with additional templates and examples available at https://dmptool.org/guidance?method=get&scope1=all (Grant Writers’ Seminars and Workshops, LLC).